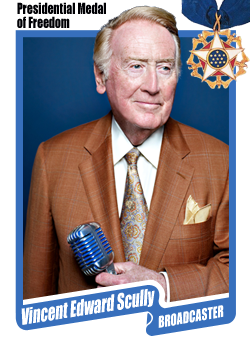 Today, President Barack Obama named 21 recipients of the Presidential Medal of Freedom which included Hall of Famer Vin Scully who this year completed his 67th and final season in the broadcast booth for the Dodgers. The Presidential Medal of Freedom is the nation’s highest civilian honor, presented to individuals who have made especially meritorious contributions to the security or national interests of the United States, to world peace, or to cultural or other significant public or private endeavors. The awards will be presented at the White House on November 22. Scully will join the following individuals in being awarded the Presidential Medal of Freedom: Kareem Abdul-Jabbar, Elouise Cobell (posthumous), Ellen DeGeneres, Robert De Niro, Richard Garwin, Bill and Melinda Gates, Frank Gehry, Margaret H. Hamilton, Tom Hanks, Grace Hopper (posthumous), Michael Jordan, Maya Lin, Lorne Michaels, Newt Minow, Eduardo Padrón, Robert Redford, Diana Ross, Bruce Springsteen and Cicely Tyson. In commemoration I made the above fantasy Baseball card using the 1990 Fleer design. Unfortunately, I am not entirely certain who originally took the photo I used in it, so I apologize for that. As time permits, I may make a few more fantasy card of Vin, so stay tuned.